The miracle depicted and described in this video is so awe-inspiring. The hymn, sung first in Greek and then in English, is so beautiful. It is the same hymn chanted at the end of the Akathist services held on Friday nights during Great Lent. What worthy hymn of praise can I offer unto thee? And what shall I name thee? Rejoice, O full of grace. Upon Galilee of the Gentiles, upon the land of Zebulon and the land of Nepthali, as the prophet said, a great light hath shone, even Christ. To Those that sat in darkness a bright dawn hath appeared as lighting from Bethlehem. 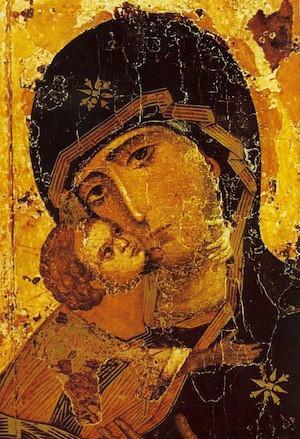 The Lord born from Mary, Sun of Righteousness, sheds His rays upon the whole inhabited earth. Come then, unclothed children of Abraham, and let us clothe ourselves our Him, that we may warm ourselves. Thou Who art a protection and veil to the unclothed, a light to those in darkness, Thou has come, Thou art made manifest, O Thou Light unapproachable. The Arabic version of this beautiful moving icon from Hamatoura Monastery (in Lebannon) is my favourite, but you can hear the English version here and the Greek version here. Merry Christmas all! May the light of Christ bring you peace and joy! Turning on the radio this time of year all manner of Christmas songs can be heard. There is one song that gets a lot of air time around this season and it always evokes a deep sadness within me whenever I hear it. It’s called “I Believe in Father Christmas” by Greg Lake. These lyrics could be said by any individual in the modern era who has ever anticipated peace and joy during the Christmas season but was left with an even greater feeling of emptiness instead. And who sold him this false “dream of Christmas”? Was it the Creator of heaven and earth Who became Man so that mankind could become god by grace? Was it the poor shepherds who received the good news of the Incarnation from an angel? Maybe it was the three wise men who traveled from distant lands to satisfy their longing to see and know God? No. It was the world, the spirit of the world, that sold him this dream. A spirit that is contrary to the Gospel. You’ll notice he points to two characters of a “fairy tale” he was duped into believing in: the Israelite (a rather derogatory title for Christ) and Father Christmas. And what happens when the dream of Truth is mingled with falsehood? Both the Truth and the falsehood are perceived as a fairy tale. This is why we need to be careful not to blur the lines between Christ’s Nativity and Santa Clause, between celebrating the feast with exaltation and celebrating it as an opportunity to acquire more stuff, eat more food. Peace and joy at Christmastime are themes continually perpetuated but often people’s experience of Christmas is devoid of authentic peace or joy. Many are left feeling cheated as the lyricist of this song so aptly conveys. Simply turning on pretty lights and giving gifts, while nice, is not enough to fill the human soul with the kind of joy it is actually longing for. Worldly joy provides something temporary, something ephemeral for the moment. It cannot provide what spiritual joy provides. Spiritual joy is life in Paradise, those who have first gone through the Crucifixion, and have been resurrected spiritually, live in the joy of Pascha. And so, I wish you all a good end to the fast, our minor “crucifixion” (of the passions) before our spiritual resurrection on the feast of the Nativity of Our Lord and Saviour Jesus Christ. 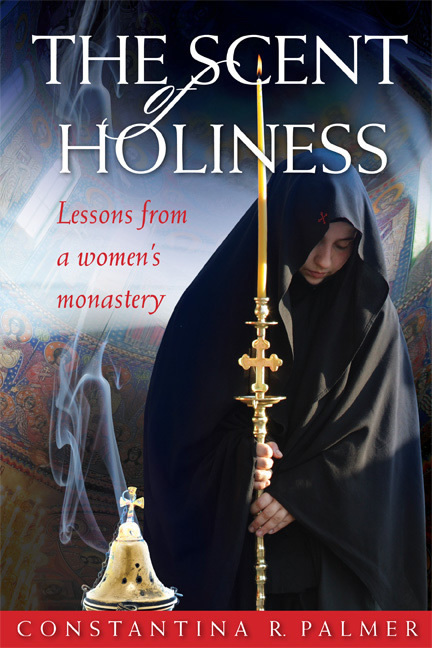 To visit the monastery’s website go here. Today, August 24th, is their patronal feast day. 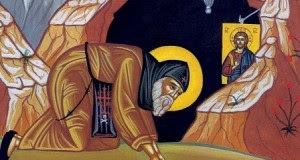 May we have St. Kosmas’ blessing! I listen to the Paschal stichera and can’t help but feel like I’m bursting with joy. The hymnology of our Church is so poetic, rich in spiritual wisdom it so deeply penetrates the human heart. There is nothing that can compare to it. Christ is risen and death is overcome! A sacred Pascha today hath been shown unto us: a Pascha new and holy, a Pascha mystical, a Pascha all venerable, a Pascha that is Christ the Redeemer; a Pascha immaculate, a great Pascha; a Pascha of the faithful; a Pascha that hath opened the gates of Paradise unto us; a Pascha that doth sanctify all the faithful. Pascha the beautiful, Pascha, the Lord’s Pascha, the Pascha all-venerable hath dawned upon us. Pascha, with joy let us embrace one another. O Pascha! Ransom from sorrow, for from the tomb today, as from a bridal chamber hath Christ shone forth, and hath filled the women with joy, saying: proclaim unto the apostles.